Welcome to day #24 of this wild and crazy March Madness series! Can you believe I’ve we’ve made it this far? The bright new paint job and the addition of the feet made such a difference in the whole style of this piece. The hardware didn’t hurt either. And you didn’t even notice the pretty curves at the bottom before. I was trying to keep what was in each drawer with that drawer. I also got one coat of paint on the two dressers, fueled by several thin mint Girl Scout cookies. They are so good! I headed back over Friday morning after I got my youngest off to preschool and filled in the holes on the nightstand drawers (since I was changing out the hardware), and got one coat of paint on all the rest of the drawers. There were 15 drawers, ya’ll!! I picked up my youngest after preschool and headed back over. I got the drawers to the nightstands sanded and painted, and one coat of paint on each nightstand. That’s when I got a phone call from my brother. My parents were leaving to come home Sunday morning! What?! They are about eight hours away. That would never give me enough time. But it was too soon to head back over and start sanding right then, so I headed home. My hubby was such a good sport that weekend, holding down the fort with the two boys without me. I told him I had no choice but to go back over and finish. After dinner, I helped get my youngest ready for bed, and then I headed back over. It took me until 3:20 in the morning to get it all sanded and waxed, hardware attached, and put back together. But it was done! That is such a great feeling. That whole corner just feels lighter. Again, the paint brings out that curvy detail at the bottom. Now they are very nice! These got new feet as well. These came from Hobby Lobby, but were originally dark on the tips. 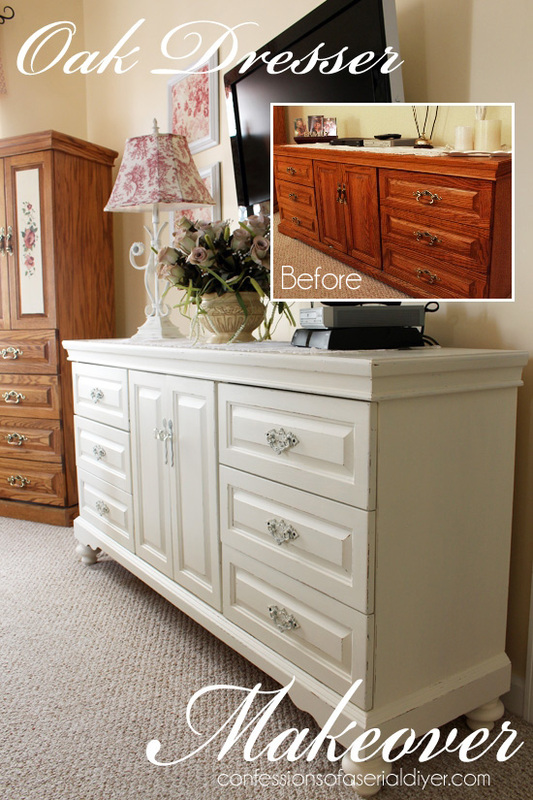 I painted them in the same Heirloom White spray paint by Rustoleum as I did the dresser hardware. 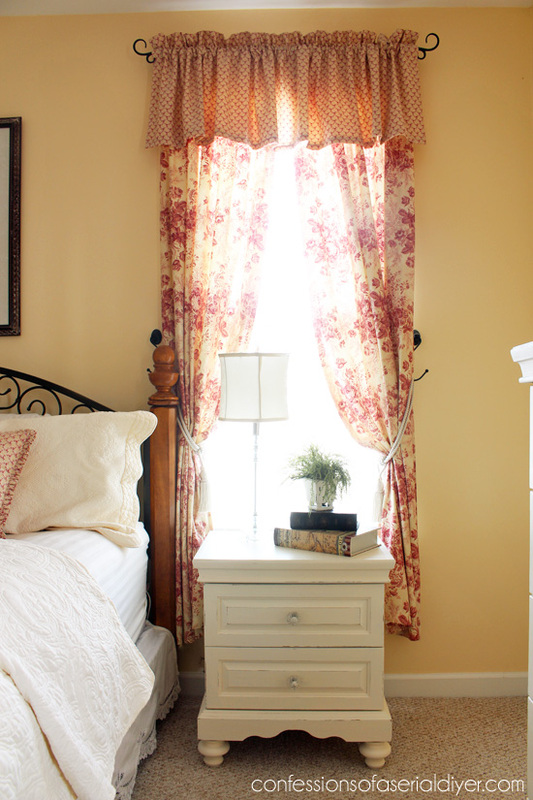 Her furniture now matches the romantic French Country style she already had going in this space. I had planned to paint the bed as well, but I knew time would not allow for it. I think it actually grounds the space very well as is. So how did my Mom like her surprise? She cried. The good kind, happy tears. She was so grateful as I knew she would be. I was so excited for her to come home and see it. She actually thought she was robbed because when she came home, it was dark and a candle with a self timer that had been on the dresser previously, was sitting tipped over on the floor just inside her closet, and that’s all she could see. I told her somebody robbed her and left her with a beautiful new bedroom set! 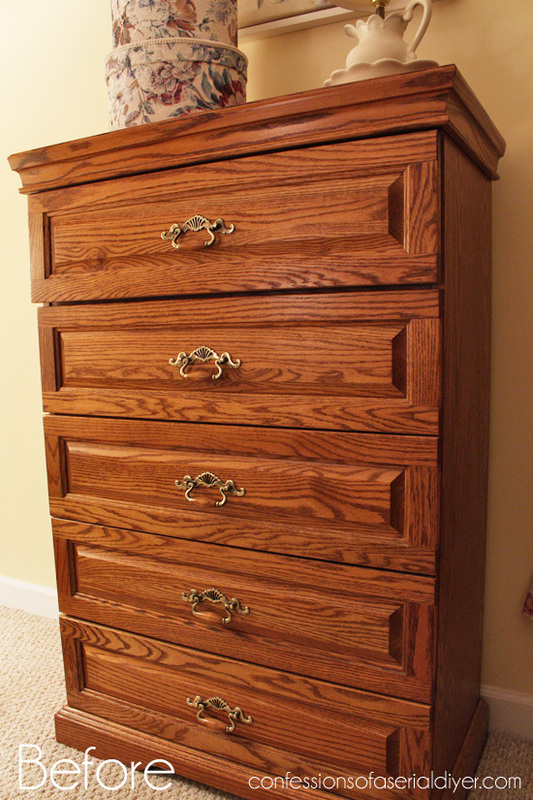 What about the one piece you can see in the pics of your mom’s dresser that looks like it has doors and drawers? Did it get redone or moved? I didn’t paint that piece. Mostly because of the time crunch, but also because my Mom is looking to replace it with a chair. Oh how sweet of you!! It looks amazing! AWww.. Christy, that was such a good post. Your mom raised sweet and generous daughter. Its so beautiful, and the added feet are perfect! Where do you get the feet from? I’m just curious…how did you attach the feet? 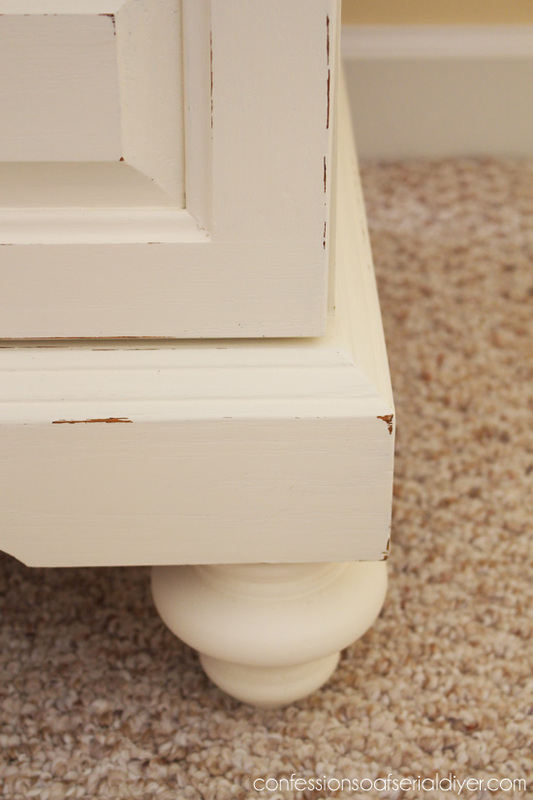 You screw these in place in all four corners and then the furniture legs screw into the threaded hike in the center. Hope this helps! Wow! Amazing transformation! You are such a wonderful daughter…great work! What a beautiful makeover! Great job. You are a good daughter indeed! 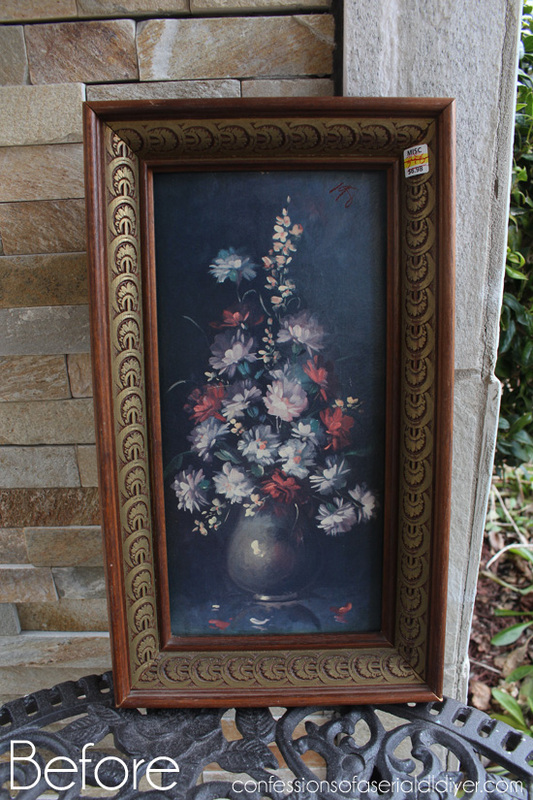 Will you leave the floral paneled armoire oak or is that a future project? How does your dad feel about the makeover? I hope he is a good sport and doesn’t whine like some men do when wood is painted. would love to know how you added the feet. i wanted to add some to a dresser, but the bottom was wonky and i couldn’t figure out how to do it. everything looks amazing! you did an awesome job–and in such a short time! Thanks, Beverly! Here is a link to the metal plate needed to attach the feet: http://www.homedepot.com/p/Unbranded-Heavy-Duty-Top-Plate-2755/100390125?MERCH=REC-_-nosearch2_rr-_-NA-_-100390125-_-N The feet have a screw on the end that screws right into the plate. Hope this helps! 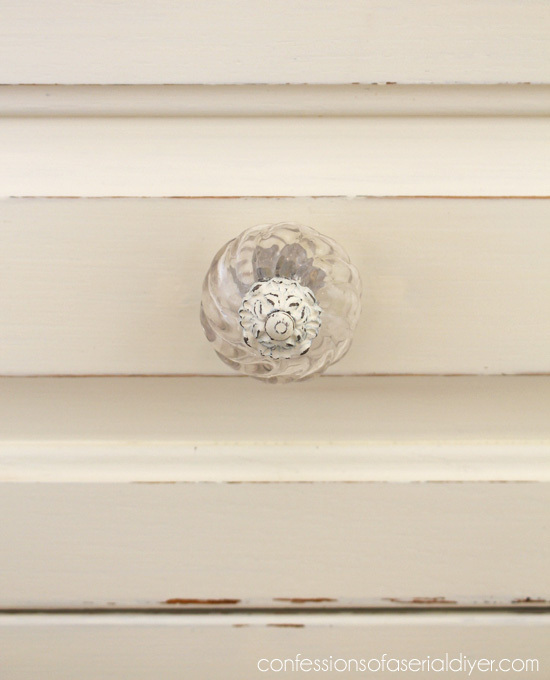 When you paint the drawer fronts, do you mask between the front and the sides? 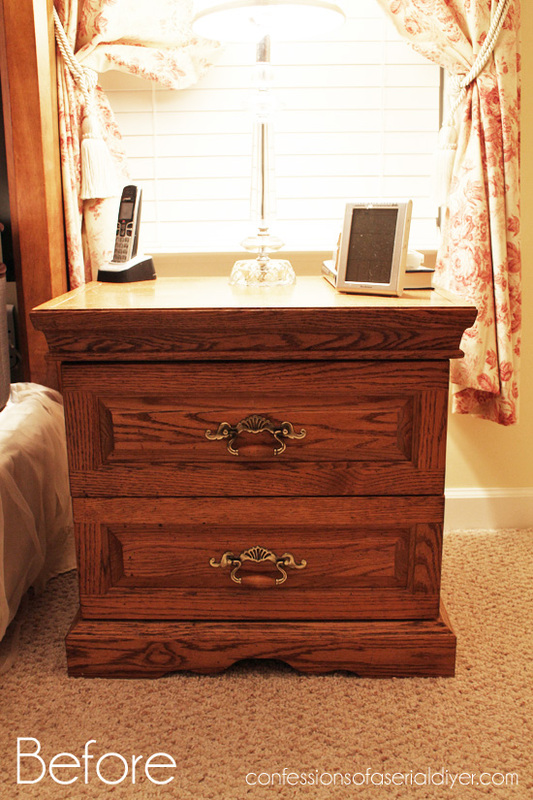 Hi Corene, The drawer fronts for these were not flush with the drawers, so it was not necessary, but in a case where the drawer front meets the sides, as in this example: http://www.confessionsofaserialdiyer.com/lacy-drawer-side-table/ , I do. I usually do not paint the sides or insides of drawers. Oh that turned out so beautiful! You are such a hard worker! Really – 3:20 a.m.??? I can’t wait to see what you do with the chair in the back of your van that you scored at the thrift store. I have one just like it!! 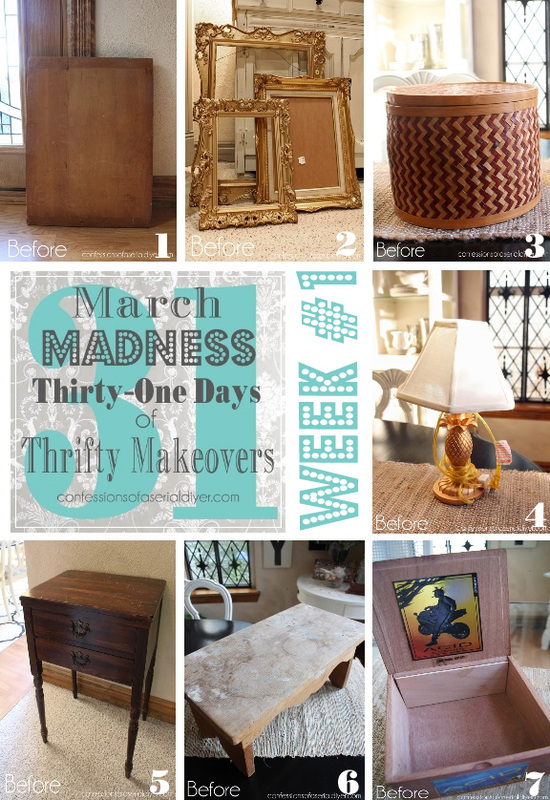 Love what you did… I want to finish a bedroom set what kind of paint and wax do you use? I have never done this before. Thanks, Marilyn! I love chalk paint for painting furniture. 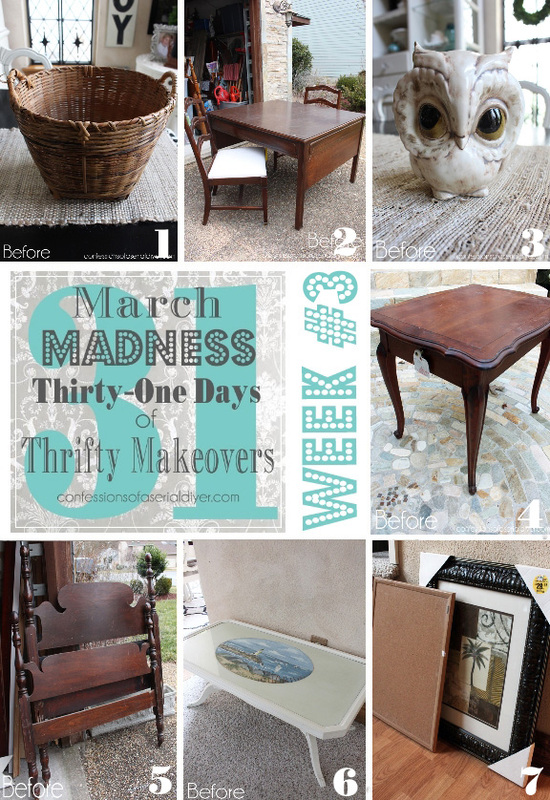 I use this recipe here: http://www.confessionsofaserialdiyer.com/sewing-stool-redo-chalk-paint-recipe-revealed/ , but I love Annie Sloan chalk paint also. I use her wax as well. You can google her to find a stockist near you. Americana also has a chalky finish paint on the market that people seem to like although I have not tried it. I’ve seen it at Home Depot with the sample size paints. I hope to put together a complete guide to painting furniture soon! Thanks so much for your reply. I am going to try your recipe for chalk paint for sure. Unfortunately I live in a small city in Ontario Canada and cannot get Annie Sloan’s products. Is there another kind of wax I could use that would be just as good. Love all of your projects . Totally amazed with the changes you made w/paint and addition of feet. 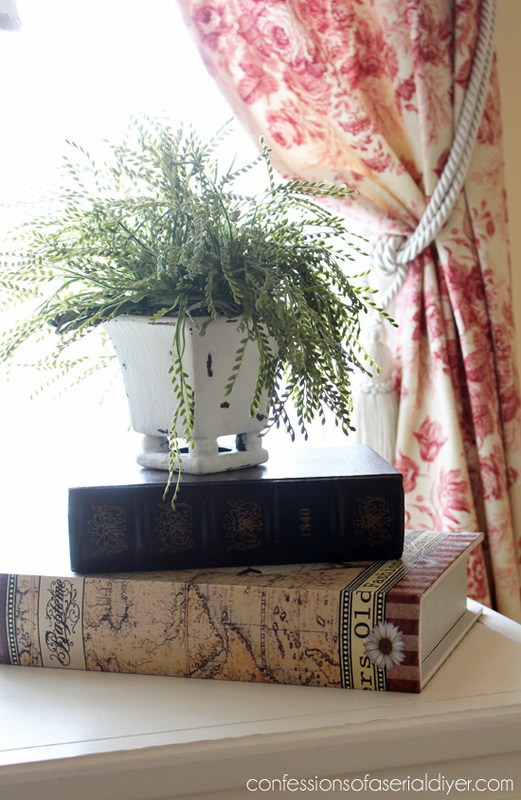 Our eclectic pieces of furniture could look more matched. Hmm, you’ve got me excited to do something. Let’s just start by saying you are amazing not to mention a wonderful daughter. Your work is beautiful and I can’t believe how much difference the feet make. I would not have thought of putting them on but they make a world of difference. Good Job you get an A+. How lucky your mom is to have a sweet daughter as you! Your story reminds me of me when I was much younger–going a mile a minute, creating, cooking, working full time and taking kids to all their doings! Whew! No wonder I’m tired now! I still get things accomplished, just at a slower rate of speed! Hahahaha! Holy, talk about being under pressure! Your whirlwind weekend was so worth it though – the room looks so fresh and pretty. 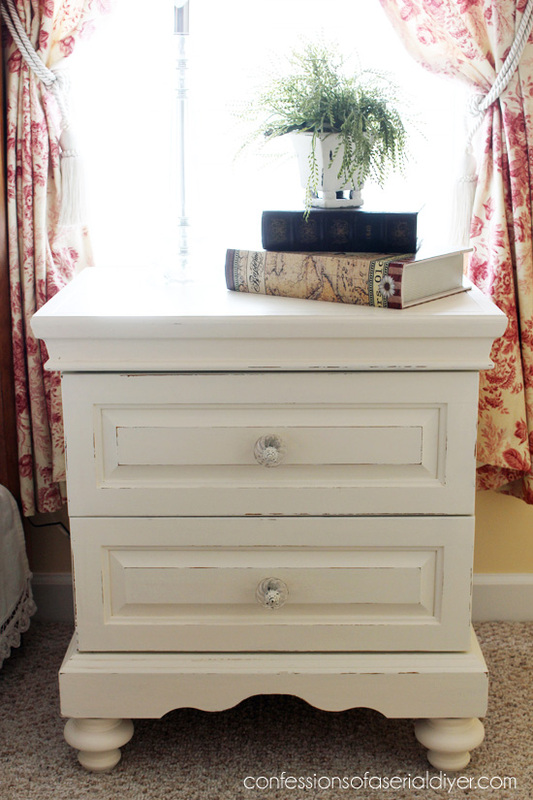 Love these pieces painted white and especially the addition of new feet and hardware. What a nice gift to give your parents Christy! I’ve got to say I think the posts on the bed would be fabulous painted too (sorry). The black metal will still ground the space. Christy, your work is beautiful and inspiring! I have a 35 year old, solid maple bedroom set that I’ve been debating painting for years and your posts might just get me to do it now! 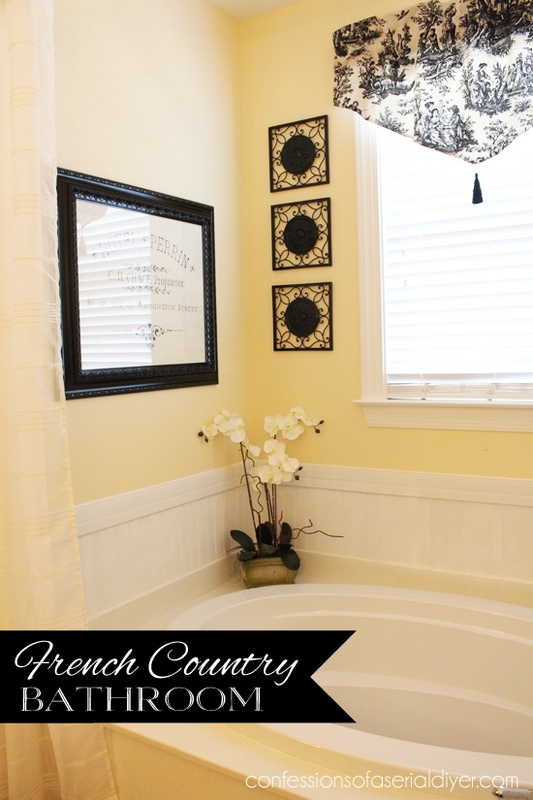 Like your mom, my look is Country French, also with a black iron headboard. Your mum has a thoughtful, sweet daughter undertaking such a big project as a gift for her! The change is stunning! Kudos to a great job! Can I adopt you Christy? I don’t usually love painted furniture, but you’ve changed my mind. You have a lucky Mama. The only thing missing is a picture of your Mom when she saw this magic! Darn! Great job. Your mom is one lucky lady to have such a wonderful daughter…..I’m sure that she is having the sweetest of dreams , now because of you! You are on a roll! One lucky mama for sure. Absolutely gorgeous! You are a very special woman~~~. Do I detect the whisperings of an E-book or something?? I have been hoping for that from you! 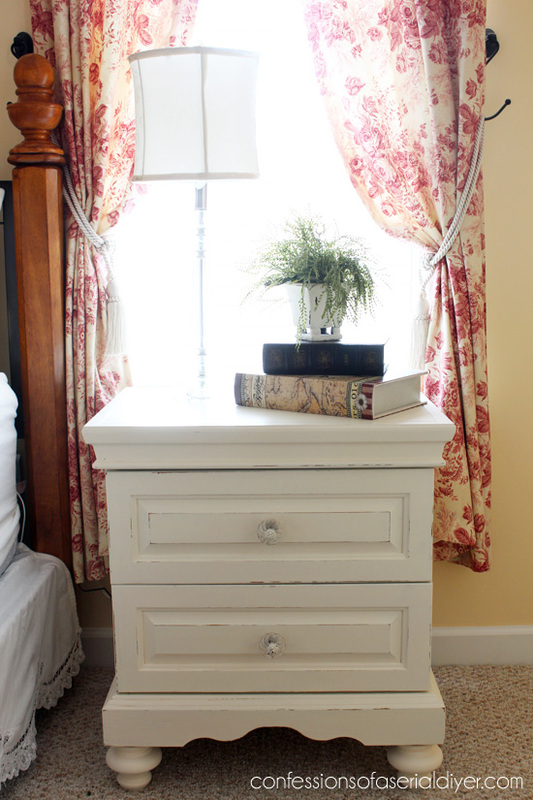 The new look is great and love the idea of the added legs to the nightstands. Thanks so much, Rose! They were really low before, but the new feet gave them an extra six inches in height! Beautiful transformation!!! Love the legs and everything about the furniture. It’s all so pretty now. Your parents are so blessed to have such a creative, talented, loving, giving and thoughtful daughter! Their bedroom looks beautiful! What a nice surprise for them! Wow, I bet you had no idea the job could be done so fast! : ) The whole room is so beautiful! Excellent work! You did a great job, Christy! I bet your mom was thrilled! 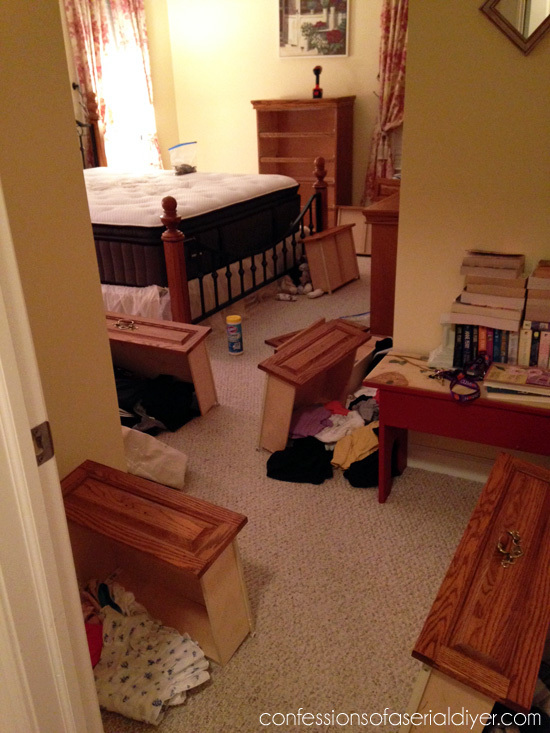 Christy, seeing what you’ve done with your parents bedroom set has convinced me to tackle our bedroom furniture, also! First, I have 3 projects I started working on simultaneously today, so when they are finished, I’ll see if I can convince the Hubs about the bedroom. Love the transformation. You’re such a sweet daughter! I love our cherry bedroom set but almost wish I had one I could paint. I have a whole dining room to do so will have to settle for that. I’m about ready to get started so have a question. What prep do you do before you paint. I’ve read some use mineral spirits but I’d rather not do that if it’s not necessary. Christy, I love the end results!! I have bedroom furniture very similar to your Mom’s furniture. I would like to paint it but hesitate because the tops seem to have an additional coat of veneer. Any suggestions? 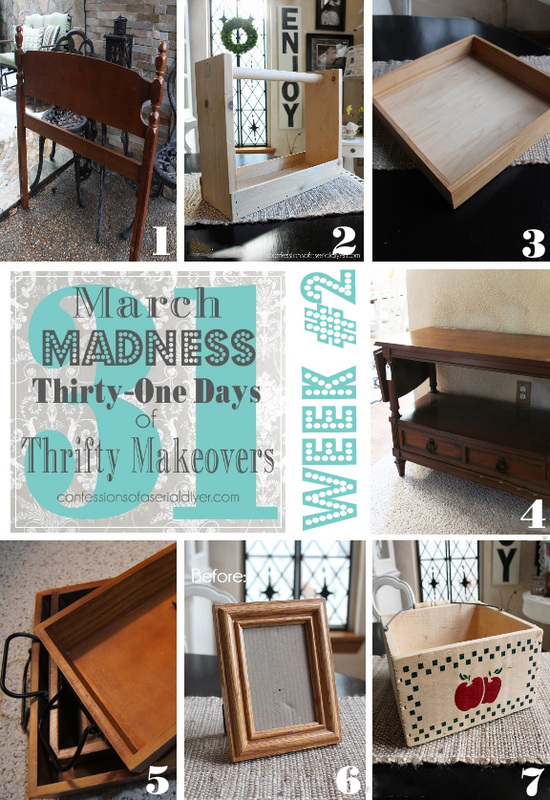 Will the chalk paint adhere? Aw, all the pieces turned out amazing! I bet your Mom was so thrilled!! And what great finds… You sure know how to thrift! 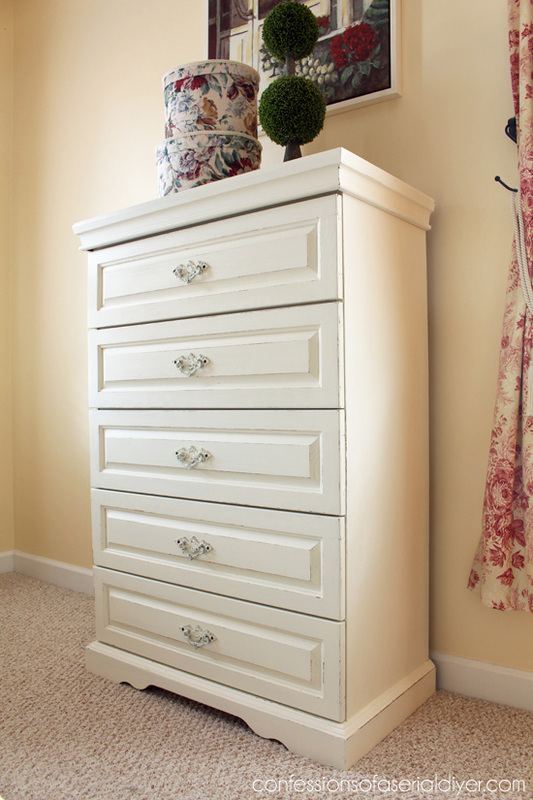 Love the makeover with the bedroom suite – dresser, chest, nightstands! It’s hard for me to paint over solid wood furniture but something is gorgeous might make me change my mind. I also love the French-inspired coffee table and coordinating stand. As a matter of fact, I could take all these projects and put them i n my house! 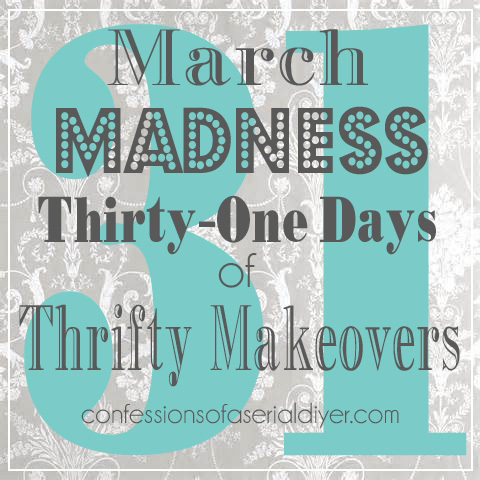 What a wonderful collection of inspiring makeovers! 1) – the nightstand knobs you said you purchased from hobby lobby – did you deconstruct them to spray paint or just dab some paint on the bronze end? If you deconstructed them did you also paint the screw part, or just the tip only? What’s the easiest way to tape off the glass – just wrap the tape around up to the edge of the metal? I really did! Here is the link on Hobby Lobby: http://www.hobbylobby.com/Home-Decor-Frames/Decorative-Accessories/Knobs-Pulls/Antique-Bronze-Ornamental-Brass-Pull/p/39421 They started an antique bronze (thought it was brass), but I spray painted them. Here is a link to the ones I used on the night stands: http://www.hobbylobby.com/Home-Decor-Frames/Decorative-Accessories/Knobs-Pulls/Clear-Glass-Swirl-Knob/p/13975 For those I did just wrap up to the edge of the metal. Hope this helps! Thanks so much for the links!! 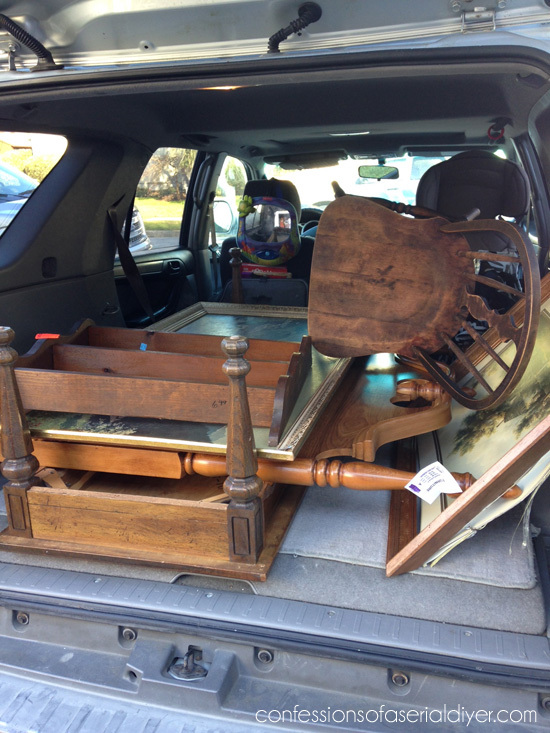 One (ok a few…) more questions – the knob and plate on the dresser cabinets – were those hobby lobby also or original? And when you paint hardware do you prime first? How many coats of the rustoleum heirloom white do you do for hardware? Do you seal it as well (with wax or poly or shellac) or is that not necessary? Sorry for all the questions! Very helpful and informative – thank you so much!! !